The outstandingly good grip and improved trigger alone will be enough for many to buy the new M&P 9 M2.0 with no hesitation. To say that the M&P line from Smith & Wesson is popular would be an understatement. In fact, according to Gunbroker, the best-selling handgun of 2016 was the M & P Shield. The S & W M&P 9 has been around since about 2005, and this version 2.0 is promised to be a major update. It retails for $599, the street price is naturally less, something like $485, and it comes with a Lifetime Service Policy. For a pistol of this genre, I'd call it good-looking, with clean lines. The grip is really grippy: a stippled type of treatment on polymer, with no less then four different grip inserts. The M & P 2.0 comes well-presented in a plastic case, with two 17 round magazines. Take-down of the M&P 9 is easy, with one quirk. You need to push the “sear deactivation lever” into the magazine with the included frame tool as shown in the owners manual. Other than that, it is just rotating the take-down lever and you can remove the slide. You do not have to pull the trigger when using this method, as in the Glock. After reassembly, insertion of the magazine pushes the sear deactivation lever back to the proper spot, so there is no further fussing with it. If that sounds like a lot of nonsense for nothing, it is only because it is. Though this is what id described in the manual, it is totally unnecessary. Pulling the trigger gets the sear activation lever out of the way and the gun effortlessly slides apart. I think we call all guess why this “feature” was added. Somebody, somewhere, was incapable of removing the magazine and making sure no round was chambered. Guns don't go bang without a round in the chamber, none of them do, but someone pulled the trigger on a loaded Glock while pointing the gun at their foot. Smith & Wesson had a one year warranty, but a lifetime service policy that begins after the one written warranty has run. I have no idea why it is set up this way, but the net effect is a lifetime warranty to the original owner, the way I understand it. 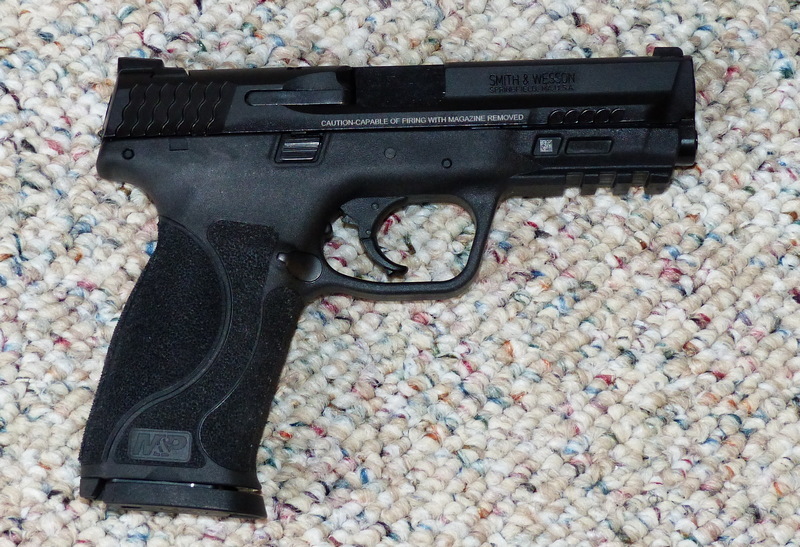 The S & W M&P 9 is not rated for “+P” ammo and the owners manual discourages its use. This area is not difficult, for if “+P” is stamped clearly on a firearm, it is +P rated, and if it is not, then it is not. Whether that is important to you or not is up to you. The Remington RP9 and the Ruger American are both +P rated for sustained use. For a full-size pistol, the S & W M&P 9 is lightweight at 24 ounces and change: about 6 ounces lighter than the previously reviewed Ruger American Pro Model 9mm, and a tad lighter than the as measured 27.1 ounce Remington RP9, which has a bit longer barrel (4.5 inch). On to the trigger, an area that seemingly few people ever agree about. The tested S & W has an extremely long initial take-up on the trigger. It breaks at a reasonably crisp 6 lbs. on the nose. It does not have the Glock center blade, present on the Ruger American, the Remington RP9, and (of course) Glock models that some may find annoying. Although this model has been called a “whole new platform,” it is a lengthy stretch at this late date to call any polymer-framed, tilt-barrel,striker-fired 9mm completely new . . . regardless of who offers it. Nuances are not completely new platforms, not matter how useful or appreciated they may be. At the same time, that's one of the perks of being a gun company: you can designate your products anyway you like. However, the M&P 9 M2.0 is extremely well-done and on the basis of the outstandingly good stippled grip and the improved trigger alone, it nets a buy rating. Other features, like the different, longer, embedded stainless steel chassis in the frame are not as readily noticeable. For anyone that liked the original M&P 9, you'll appreciate this model more. The S&W M&P9 M2.0 proved to be a dream to shoot. It reliably feeds and ejects every type of 9mm I tried, including the Hornady 100 grain Critical Defense loads that have stuffed up many pistols, but not the S&W MP9. The stippled grip on this gun is outstandingly good, a dream grip on a factory 9mm pistol. With four included backstraps, it may not fit everyone . . . but it is going to fit almost everyone. I like the balance, the trigger, the looks, and it is far more accurate than I am, grouping 2 inches at a bit over 12 yards (37 feet) without the benefit of any pistol rest, much less a Ransom Rest. This is the best S&W pistol I've tested: little things mean a lot, and it all comes together here as a great-handling, superbly reliable piece that I found supremely satisfying. My history with 9mm pistols goes back a very long ways, from Walther P-38's and Browning Hi-Powers to Glocks and numerous Glock-esque polymer frame striker-fired pistols. The S&W out-handles and outperforms the Ruger American, the Ruger SR-9, the Remington RP9, various Springfield Armory XD models, and the Glock 17 itself. For years, my standard nightstand gun has been a Glock 19: my Glock just got retired in favor of this S&W M9. I suspect that once you shoot one, you'll have to have one. Congratulations to S&W for this highly desirable, industry-leading product. It is hard for me to wax wildly enthusiastic about another 9, but it is easy for me to do so here. S&W has achieved something special in the M&P9 2.0.